The vendor landscape of the global water pumps market is highly consolidated with top players such as Flowserve Corporation, Wilo SE, ITT Pumps, Sulzer, KSB Inc., Ebara Corporation, Xylem Inc., and Alfa Laval collectively occupying majority of the market, observes Transparency Market Research in a recent report. The water pumps market is characterized by new product development, technological improvements in products, and acquisitions of smaller players by global conglomerates. However, the market also features less intense entry barriers for small, unorganized players who are capable of developing and marketing cost-effective products to serve a rising consumer pool in emerging economies. Despite the presence of several international players, small-scale suppliers in China account for a notable share in the global market, serving the demand for low energy consuming and economical water pumps across Australia, Southeast Asia, India, and Eastern Europe. Under such circumstances, strategic collaborations, mergers, and acquisitions done with the view of consolidating the market in lucrative regional pockets could help international players strengthen their competitive stance. According to the report, the global water pump market was valued at US$43,599 mn in 2016 and is projected to reach US$66,852 mn by 2025, expanding at a CAGR of 4.9% between 2017 and 2025. Centrifugal pumps are the most widely used pump type and are generally preferred over other pumps due to their simple design, smooth flow rate, wide range of capacities, and ease of maintenance and operational efficiency. The centrifugal pump segment accounted for over 50% of the market in 2016 and is expected to exhibit a promising CAGR of 4.9% over the forecast period. 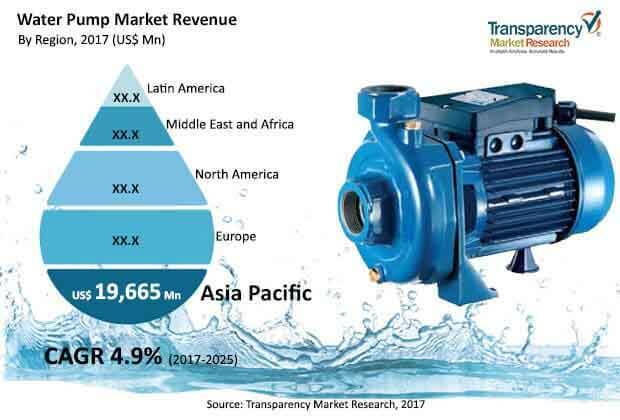 Geographically, the market in Asia Pacific is presently the dominant contributor of revenue to the global water pump market, trailed by the markets in Europe and North America. Factors such as the vast rise in infrastructure development activities and rapid development of several industries in the emerging economies of Asia Pacific such as India and China has been propelling the market for water pumps in the region. The global market for water pumps is massively benefitting from the rising numbers of water recycling and water waste treatment plants, especially in emerging economies of Asia Pacific region. Moreover, plans to foster urbanization, such as the initiative taken by the Chinese government to shift 250 mn people from rural areas to newly established towns and cities over the next ten years, could lead to an increased demand for a variety of water pumps. Demand is also rising across the general industry sector, driven by the increasing use of cost efficient pumps across areas such as agriculture mining, pharmaceutical, food and beverage, and paper and pulp. The power generation industry has also witnessed massive transformations in the recent past, leading to imminent updations and modifications in power generation infrastructure, across both developed as well as developing economies. Apart from these factors, increased demand across the agriculture sector, easy availability of cost-effective products across price-sensitive emerging economies, and advent of innovative technologies such as intelligent pumps, which extend cost benefits to users, are also fueling the global water pumps market. Rising demand from the steadily expanding oil and gas industry and from municipalities is also expected to drive the market.